A Building Maintenance Unit (BMU) is an automatic, remote-controlled, or mechanical device, usually suspended from the roof, which moves systematically over some surface of a structure while carrying window washers or mechanical robots to maintain or clean the covered surfaces. 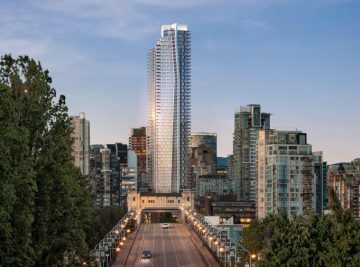 Building Maintenance Units are required on the more complicated building designs, and provide a sophisticated façade access solution. They are usually mounted permanently at roof level, and provide full lateral, horizontal and vertical movement of the working platform, in order to access all surfaces of a building. The system is designed for scheduled façade maintenance e.g. window washing & external cleaning, and unscheduled maintenance e.g. replacement of glass/façade panels and other repairs. ATLAS, in partnership with the world leading manufacturer MANNTECH Fassadenbefahrsysteme GmbH, offers the highest quality and most technically advanced Building Maintenance Units (BMU). 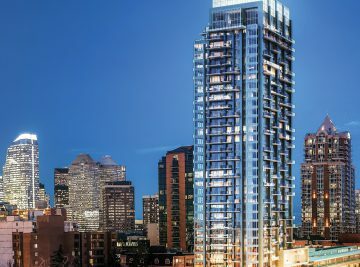 The BMU is tailored and specifically designed for the building on which they are installed. There are two types of hoist systems on the BMU market: drum and traction. The Atlas / MANNTECH® alliance uses the drum technology, the most popular on permanent systems used on most of the world’s tallest buildings. The drum technology is good for heavy duty, high safety lifting equipment like crane, elevator etc. On the contrary, the traction type (friction technology) is good for self-powered basket. 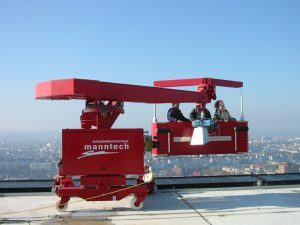 Its good mobility and light weight are ideal for temporary use but not for permanent system on high-rises. – Simple and safe to operate. It can be operated in narrow spaces. – Maintenance-friendly. Hoist will operate for long periods of time without need for overhaul. 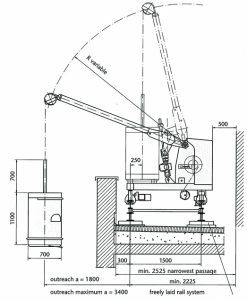 – Hardly visible on buildings from ground level when implemented with retractable jibs. – Entrance and exit of the cradle (platform) can be situated at front or rear of the machine, according to preference and local conditions. – Almost unlimited possibilities of combinations and installations based on continuous development. These crane type machines are composed and modified from a comprehensive modular design to suit each building’s geometry and height. 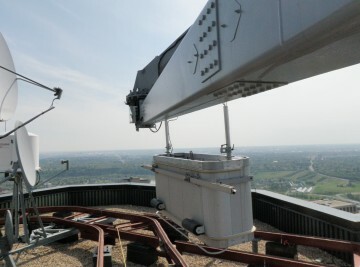 They can run on concrete runways, be installed on track systems or be directly connected to the building structure. 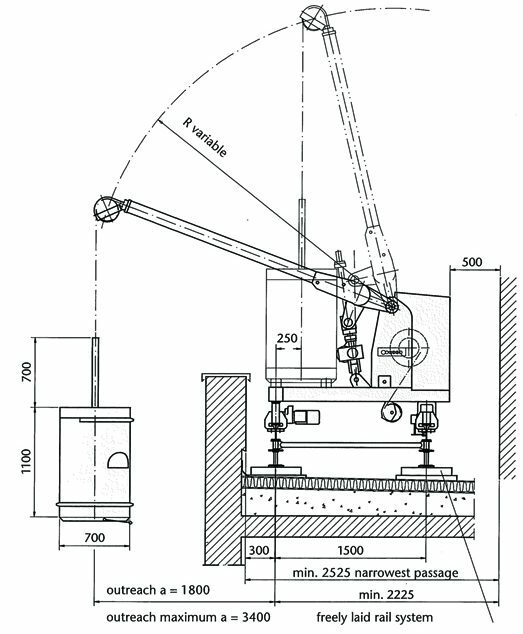 Crane type machines are compact in design with a central, overhead slewing jib and slewing head. Espe-cially suitable where medium reach is necessary due to building terraces, recesses, protrusions or obsta-cles on the roof. With the slewing head located on the jib point, the cradle can always be positioned parallel to the building façade. With its stationary powerhouse and slender architecture it is particularly suitable for narrow passageways and small track gauges. 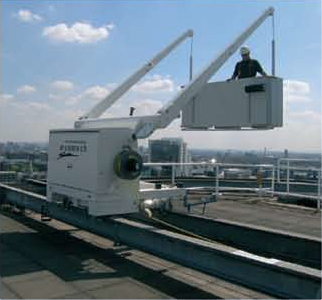 These machines are mainly deployed in situations in which large projections are required due to building terracing or obstacles on the roof. 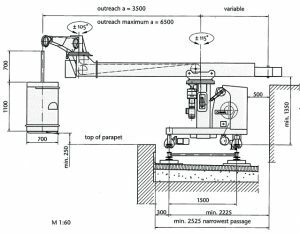 The crane type machines with standard proportionate projections of up to 40 meters also bypass substantial building terraces. At the same time, efficient performance is guaranteed through the functionality built into each machine. 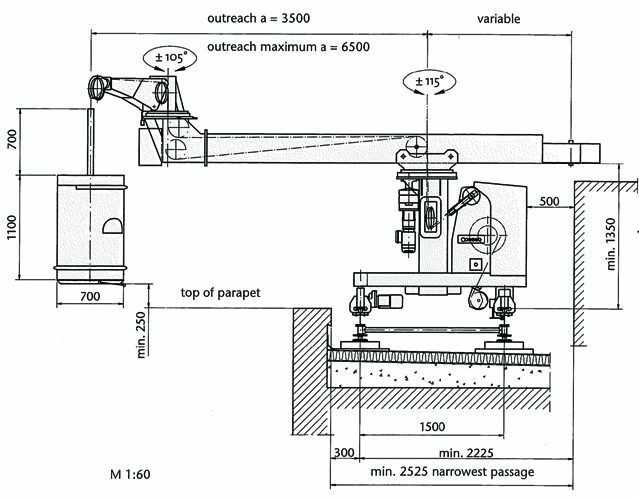 These crane type machines are characterised by a long jib with a slewing head. In practice, a single unit of this type, positioned correctly on the building, can service the entire building complex including all its terraces and annexes. Typically, the machines either run on horizontally laid tracks or they are anchored to the building in a sta-tionary position. They are also often made to telescope vertically to an operating position that clears all roof obstructions, while parking below and between the obstructions in order to be hidden from sight when not in use. These products are maintenance friendly and built to last. This is a fundamental and valuable component, as access is often hindered by scaffolding systems, gantries and so on.